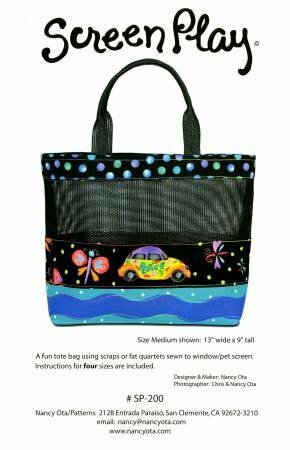 Screen Play is a pattern for a handy tote made with window/pet screen fabric that is available at hardware stores. This tote measures 13" wide x 9" tall. Includes instructions for 4 sizes. You may also enlarge or reduce your tote by measuring your favorite shopping bag to create your own "custom" size -- big or small. This is a FUN tote bag using scraps or fat quarters sewn to window/pet screen material.